There is absolutely no household that cannot do with the warmth, richness, and finesse that a wooden piece of furniture brings. In actual fact, wood is one of the main materials used in the past and even today when it comes to furniture. Because wood is such a Nature-Connected interior design element, it can completely transform the mood and feel of your home, giving it that welcome, and organic sense. With this in mind, why not opt for a warm and inviting, wood recliner, to enhance your home, and ensure endless comfort. Strength: Wood is a robust and long-lasting material, with innate stability and reliability. Because of its durability, wood is an excellent value for money in any piece of furniture. Appeal: Wood has a warm, rich and organic feel to it, bringing aesthetic allure to your home. there are many different types, hues, and colors of wood to choose from which will blend well with your background décor. Sustainable; Only IF RESPONSIBLY SOURCED, wood is a good option for sustainability and ecologically sound. Wood is one of the only renewable materials that you will find, and trees harvested specifically for their wood can be easily regrown. There is a vast range of tones, colors, hues and textures of wood available to create a certain style or image. Unlike so many other material types Wood looks good in any setting, fits into any style or décor theme, and can be used both indoors and outdoors, in any area of your home. Anyone seeking that cozy cottage feel, or a rich and warm feeling in their home, will benefit greatly from solid wood or original wood furniture. 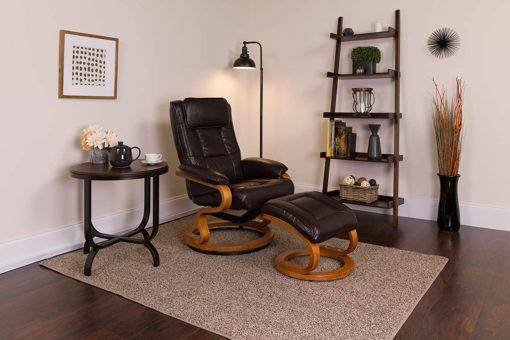 Along with some Vintage accents, a wood Recliner can be the perfect piece for comfort and interest in your home. This is just one idea for using wood piece or recliner in your home. When it comes to décor ideas with wood, there are absolute, no limits! Mahogany – lightweight and strong. Oak – Durable and inexpensive. Maple – Durable, non-toxic with many grain patterns. Cherry Wood – Darkens with time, rich appeal and scratch resistant. Pine – Soft texture and very affordable. Cedar – Soft and weather resistant, perfect for outdoor furniture. When considering a wood recliner, make sure that the wood is quality, and if possible solid wood. You can also choose between an upholstered or cushioned, recliner, or complete wood with an additional pad or pillow for comfort. Features such as a retractable footrest and different recline positions, are the basic features that you will find in a wood recliner. These are some of the best available and highest quality Wooden recliners that you will find, in different styles and shapes, each with some unique and enticing features, for your perusal. Flash Furniture is a brand well known and much sought after, particularly when it comes to their recliners. The Contemporary Wood and Leather recliner is a magnificent example of one of the pride pieces, which is skilfully finished off and designed to look fabulous and feel even better. Manufactured from rich and luxurious Maple Wood, that is of the finest quality and the most beautiful color. The recliner is easily adjusted with a convenient knob for different recline positions, providing you with the ultimate relaxation characteristics. The arms, back and seat are Plush upholstered, for support and comfort. A ball is bearing a swiveling base for easy movement that is smooth and quiet. rich brown leather upholstery, with a soft and elegant feel to it. An additional ottoman with similar finishing and materials, that is likewise padded for soft and luxury comfort to your legs and feet. This is an absolutely breathtaking Luxury item, with the ideal functions of swivel and recline, and to top it off you have a very handy and versatile Ottoman in a similar style. Top Grain, fine quality leather upholstery available in Cobblestone, and Merlot, color options for you to choose from. Has a swivel and recline function that works smoothly and easily. Offers excellent Lumbar Support, and full body comfort. There is also an ottoman that is fully padded to rest your legs comfortably on. You are looking for something natural, unrefined and perfect for the outdoors. 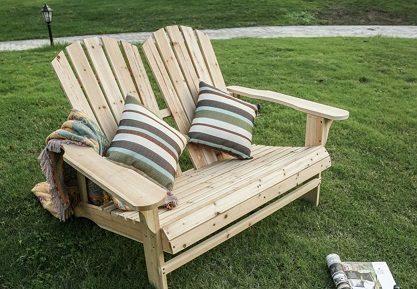 Well, the Fresh Zone Outdoor Living Leisure Twin Recliner is made from natural Fir Wood, with all its natural markings, as nature intended. Topp this Recliner off with a comfy cushion, and you have a luxury outdoor or patio recliner for yourself and a loved one. Manufactured from Natural and unrefined Fir Wood, for a strong and organic appeal. Can handle the weight of up to 310lbs. A well crafted and simplistic design with elegant finishing touches. Available in its natural Beige color. Full recline for comfort and relaxation. Not ideally a complete wooden recliner, but a rather superb Vintage styled piece with some attractive decorative details, in a rich and intoxicating brown leather. Covered with a very durable and comfortable Bonded Leather upholstery, in a Rich Dark brown shade of color. Full recline with Push back function that is easy to use and very comfortable. Solid Wooden legs in a dark shade, with gorgeous decorative details. Very simple to assemble and comes with full instructions. The Lounge Chair is a solid Bamboo wooden reclining lounge chair, that can be folded for portability and storage. Manufactured from highly durable and weather resistant Bamboo wood, in a golden brown color. There is a Lift Up Footrest that can be adjusted up to 6 levels. Recline positioning for further comfort. This chair folds flat completely for convenient transportation and storage. A multi-purpose design that can be used for all occasions, both indoor and outdoors.